Heat oil in skillet over medium heat. Add ground chuck, crumble the meat as it cooks, add chili powder, cumin, salt, pepper, paprika, garlic, worcestershire sauce, fire roasted tomatoes, green chilies, stir, cook until no longer pink. Add white onion, cook another 3 minutes. Preheat oven 450. Lightly coat muffin tin with cooking spray and press tortillas into cups. Bake 3 to 5 minutes. 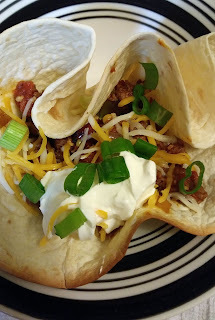 Divide meat mixture into tortillas cups. Top with lettuce, cheese, sour cream and green onions.